The reading talks about a poor widow and her humble offering of two small coins contrasting it with the rich lot boasting and casting much more into the treasury. It was a very small amount what the widow had offered but Jesus was satisfied with that because she gave that out of her poverty but the others gave out of their abundance. It makes us think as to what type of offering does God accept then. Genesis 4: 3-7 tells us about the two brothers, Cain and Abel’s and their offerings. 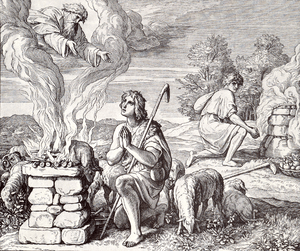 Cain offered first proceeds from the ground and Abel offered firstborn flock and fat portions. Lord accepted Abel’s offering but not Cain’s and Cain became angry. Then the Lord asked Cain why was he angry and that will not his offering be accepted if he had given it from his heart? Through this we can understand that God expects an offering from our heart and not for the sake of it. II Corinthians 9:7 tells us that one must give as he has decided in his heart and not reluctantly, for God loves a cheerful giver. II Corinthians 8: 12 says that, for if the readiness is there, it is acceptable according to what a person has and not what he does not have. The poor widow also gave from whatever she had which was for her living. I Samuel 1: 27-28 tells us about Hannah giving her only son to the Lord who she got after prayers. Hannah gave Samuel to the Lord with her whole heart. The Lord called Samuel and established him as a prophet. In Genesis 22: 2-3 we see that God tells Abraham to give his only son as a sacrifice, the son who he got when he was 100 years old. Abraham doesn’t ask anything and is ready to give what God asked. Even David in Psalm 19:14 writes, let the words of my mouth and the meditation of my heart be acceptable to God. When we give something we feel satisfied if it is given from our heart, be it even the praises that come out from our mouth. And for the Lord who has done so much for us, we can at least do everything from our heart, be it even a very small thing.